Raspberries are an excellent low FODMAP fruit to incorporate into desserts such as this Raspberry Crisp. In case you, like me, had never heard of a ‘crisp’ before, it’s an American dessert that’s very similar to a British fruit crumble, but the topping has a more biscuit-like texture. It’s a really quick dessert to make and never fails to be a crowd-pleaser with my family. 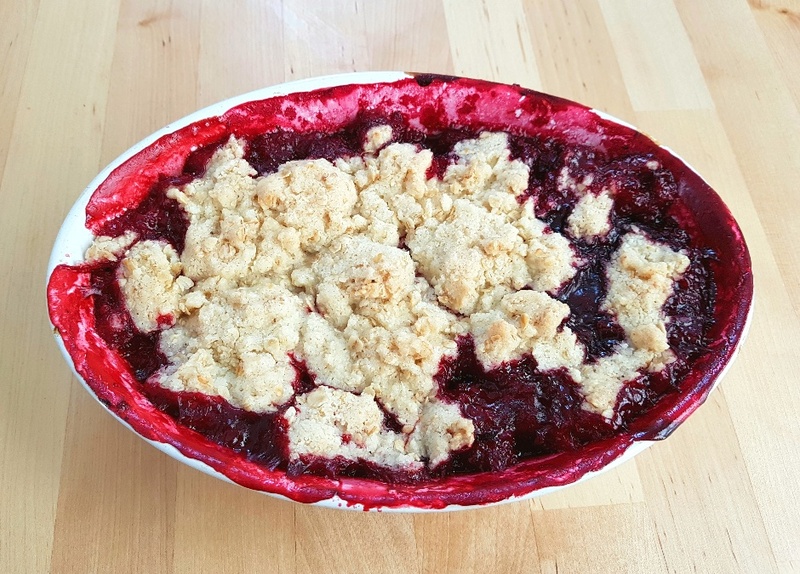 Most British fruit crumble toppings tend to be made solely with butter rubbed into flour and sugar to produce a fairly robust lid for the fruit base, but this raspberry crisp topping incorporates oats into the crisp lid which helps to ensure that the top remains ragged and crunchy. The oats also help to add a naturally nutty, toasted flavour to the raspberry crisp too. Although I make mine with raspberries, you can make this with strawberries instead, if you like. In fact, using both raspberries and strawberries makes a lovely blend and as long as you don’t go over the total limit of 180g of raspberries, you can add as many FODMAP-free strawberries as you like and the strawberry crisp remains low FODMAP. (This is helpful to know if you want to bulk out the recipe to feed more than a minimum of four people.) I also like to add a little bit of dried ground ginger into my raspberry crisp because I think the hint of ginger really enhances the flavour of the raspberries, but it’s an entirely optional step. 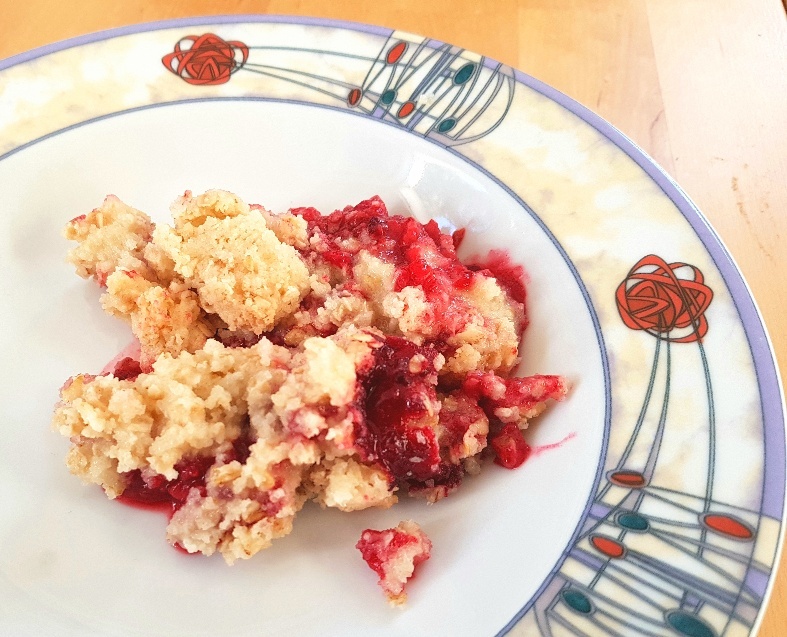 For all that I love making my Rhubarb and Ginger Crumble in the autumn, I always really enjoy making this raspberry crisp too because the fruit melts down to produce a sweet, tart jam that’s topped with a sweet, crunchy biscuity crisp topping which pairs brilliantly with lactose-free or non-dairy cream or ice-cream. It’s an excellent way to use up the autumn bounty of raspberries! Preheat your oven to 180C/160 Fan/350F/Gas Mark 5 and put the raspberries in a small casserole dish. Get a large mixing bowl and measure the sugar, flour, oats and (dried ginger, if you’re using it) into the bowl. Add the solid butter or coconut oil and rub it into the dry ingredients until it has the texture of wet sand. Sprinkle the crisp topping evenly on top of the raspberries and bake it in the oven for 25-30 mins or until the crisp is golden brown.